Transfiguration School was built in 1937 by the Archdiocese of Los Angeles under the pastoral leadership of the late Msgr. James F. Buckley. The primary structure consisted of five classrooms and a library. Serving a large population demanding double grades, the school was expanded to two buildings with 16 classrooms and a health room. The first five classrooms were opened for school on September 13, 1937 with 150 students. By 1953 the school reached its peak enrollment of 759 students. 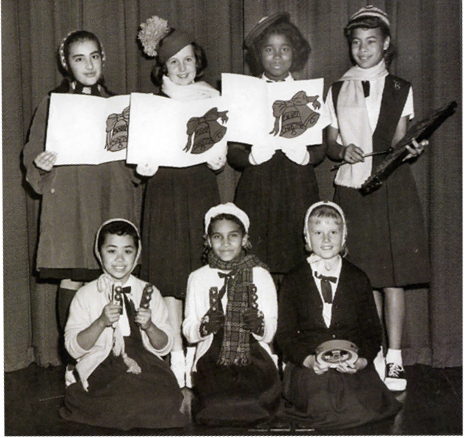 With decreasing enrollment in the 1960's and the archdiocese' recommendation, classrooms were gradually reduced to 9 and a kindergarten was added. This resulted in a school enrollment of 350 until a Preschool was started in 1996 for 3 and 4 year olds. The sisters of St. Joseph of Carondelet provided leadership and teaching staff for 56 years. Sister Carmela Lucas was the first principal. It was in 1993 that Mr. Oscar Pratt was hired as the first lay principal for the school. He served for 13 years, followed by Ms. Terry Dicks for one year and Ms. Mechele Yermina from 2007 till 2013. Ms. Evelyn Rickenbacker serves as principal today.